One would have to think that anything coming out of a little town called Swineshead would be a little different. 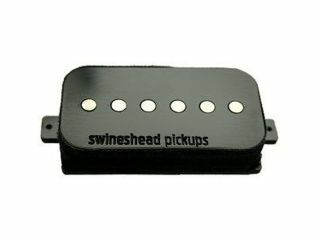 And that's what Swinshead pickups are: handmade, and definitely different. Consider the new single-coil pickup called the SH90. Here is a single-coil pickup in a humbucker housing -- it'll fit any guitar that would normally use standard humbuckers. This opens up a range of unique and previously unavailable tones. Swineshead has made the SH90 wider than a conventional single coil, the reasoning being that it will detect a greater length of the strings above, thereby producing a crisp, clear tone with more warmth than standard single coils (yet with more high end and less bass than a humbucker). Like all other Swineshead pickups, the SH90 is available in a wide range of colours, woods and finishes. Plastic SH90s are £44.95 each while the wooden SH90s are £54.95 each. Postage is free worldwide on orders over £70. Each pickup comes with all the necessary screws and springs to mount it in your guitar. In addition to the SH90, Swineshead have also opened their new custom shop offering one-off pickups of unique shape, size or design. The custom shop can can build pickups using any shape or design for any number of strings. Smaller pickups for instruments such as lutes (perfect for Sting!) or mandolins can also be built as well as standard guitar and bass pickups that require unusual string spacing. For more information, visit the official Swineshead Pickups website.